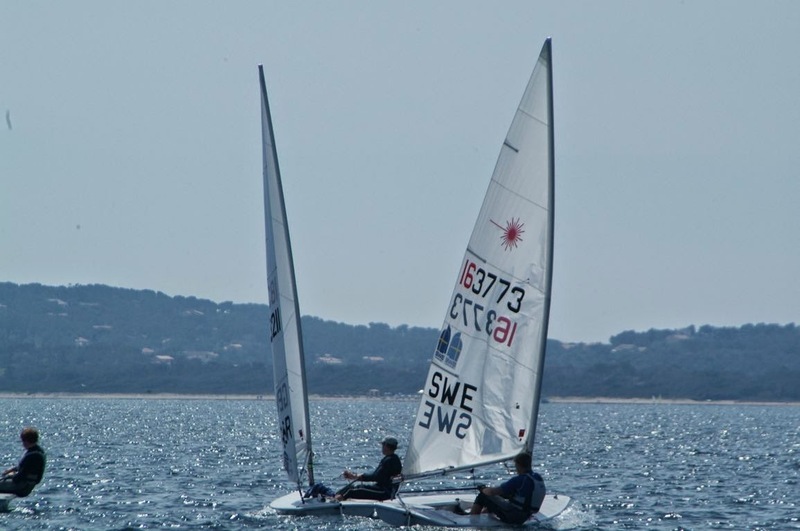 I'm really looking forward to Hyères because with more than 500 entries, it will be competition at its best. I really hope that they do not split up our fleet because having that many boats on the line will be a real challenge and treat. So, as everyone prepares for the huge fleets, here are some starting thoughts from one of the best - Paul Goodison on his way to winning one of his European Championships. 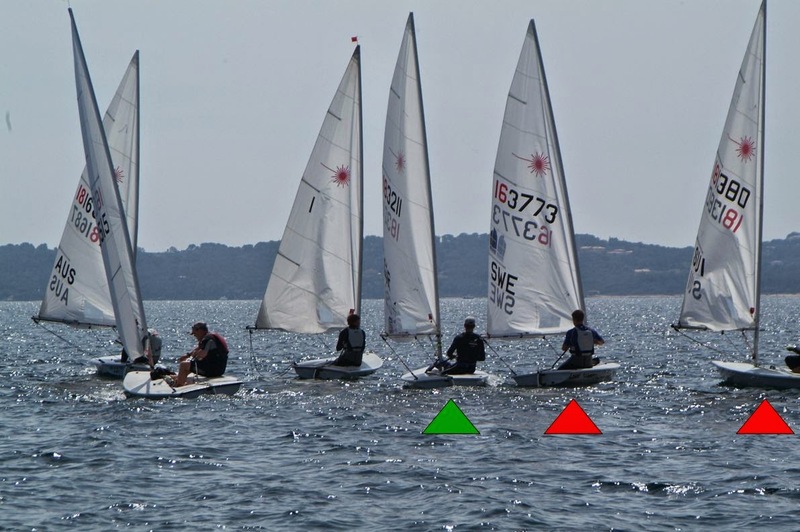 I've highlighted Paul in green and we'll be watching how he manages his main concern - the boats just above him on the starting line (SWE1, SUI, SWE2). This sequence begins with Paul in a bit of a jam. Paul heads up slightly with 30 seconds to go. SWE1 reacts, SUI and SWE2 do not see this. Paul bears off, SWE1 does not, SUI is in trouble, SWE2 is not reacting yet. SWE1 is trying to protect against SUI while SWE2 is only now reacting. Paul is sitting pretty. 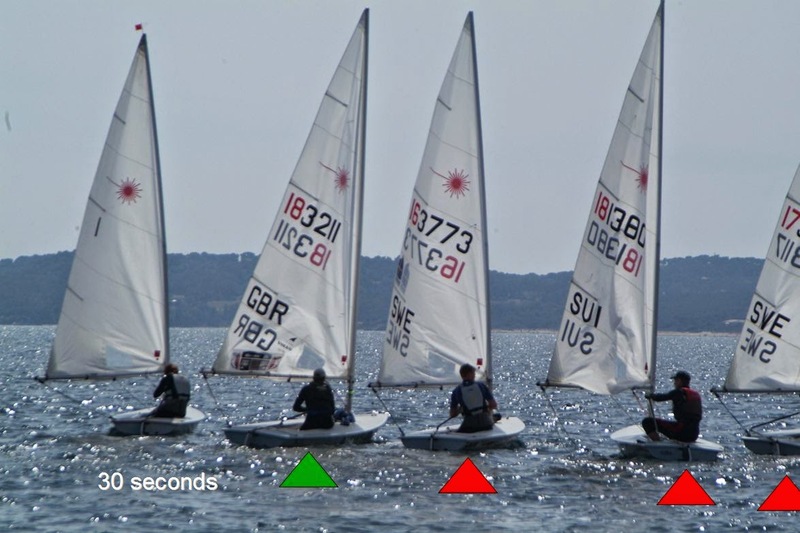 SWE1, SUI, SWE2 are fighting, Paul with a good lane bears off to build speed before the start. At the gun, Paul flattens to accelerate while SWE1 only now gets ready to accelerate. SUI is trying to hold off SWE2. 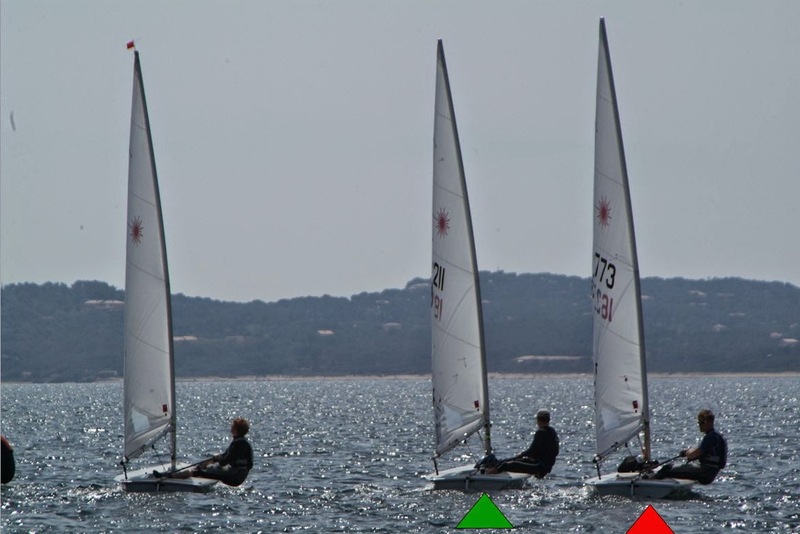 Note that Paul, with a good lane and speed, is already focusing on what's upwind. With good speed, Paul outpoints SWE1. ...and gets out of there. 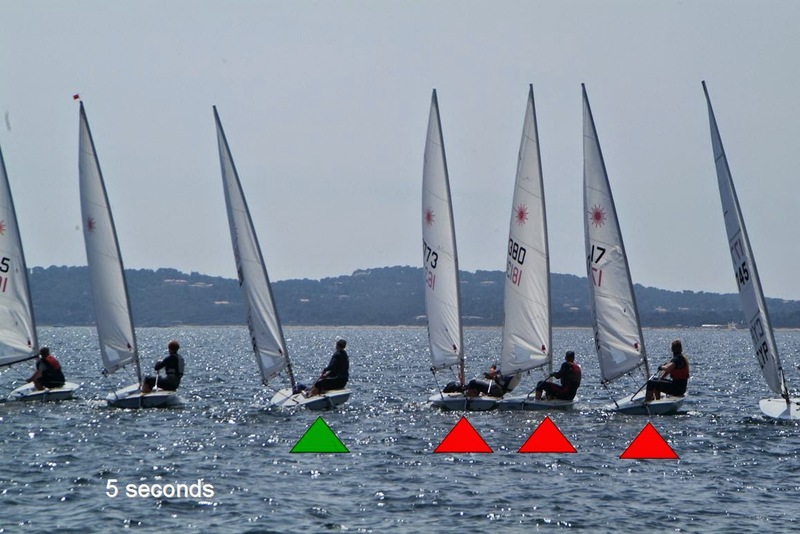 A simple bump-and-go with 30 seconds to go caused the windward boats to defend at the moment when they should have been thinking about ways to be aggressive and accelerate. This turns a being-jammed-start into a textbook-perfect-start. Sure does. His position at the gun was good but his speed off the line was really good. Notice how flat he keeps his boat. If boat 1 to his leeward had noticed and also gone up it might have not worked out so well for Goodison, and maybe opened up more space for boat 1. But, I imagine boat 1, like most of us, was more concerned about watching the space to leeward. Agreed. Boat 1 looked slow and unaware... perhaps why Paul chose to start there. 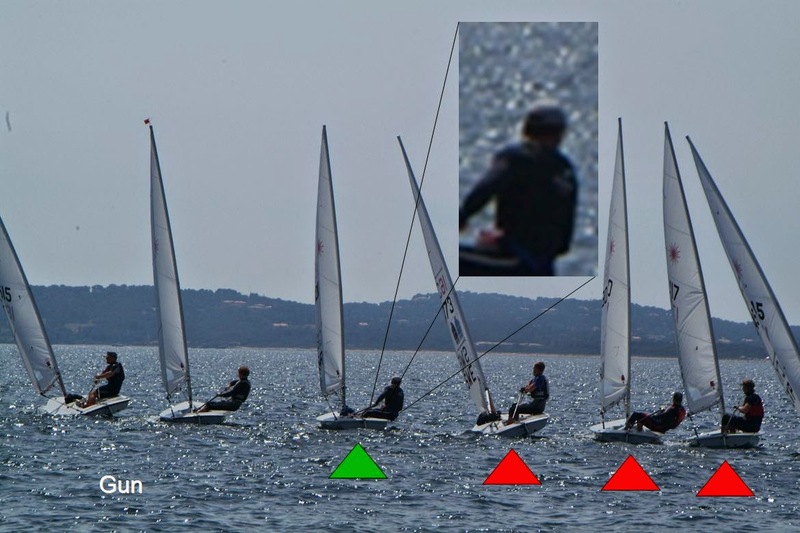 There are lots of sailors who look for easy targets at the start. Isn't the time of a move like this absolutely critical? 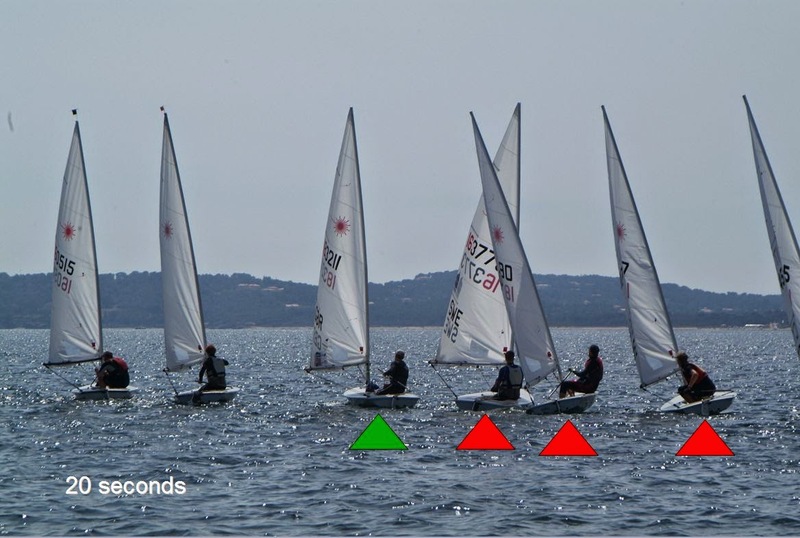 Time enough to create a gap to leeward and to be able to use it, but not long enough for the boat to leeward to react (maybe having chosen someone who might not be quick to react in a situation like this) or long enough for another boat to steal the gap. Is 30 seconds a good time, as a rough rule of thumb generally, to initiate a move like this? I think that 30 seconds is too early, but Paul probably knew who he was dealing with. 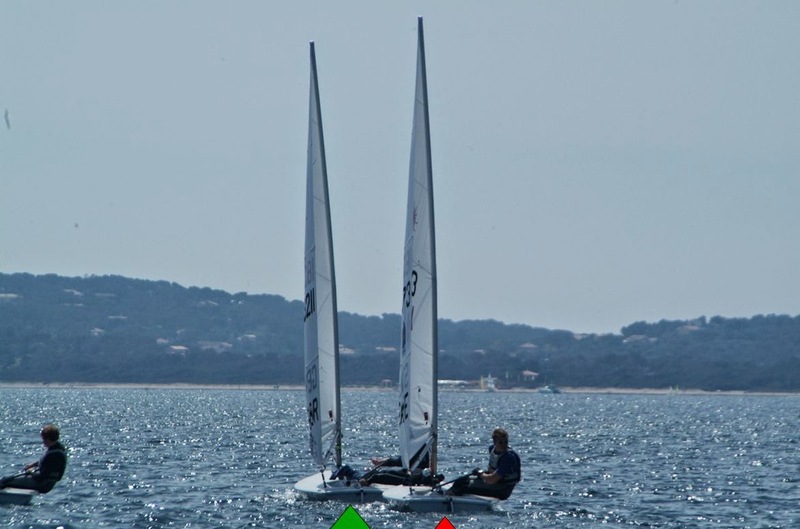 Two other things that can be useful: turn off your ratchet to disguise when you sheet in, and heel to windward to make the boat on your hip much more cautious. 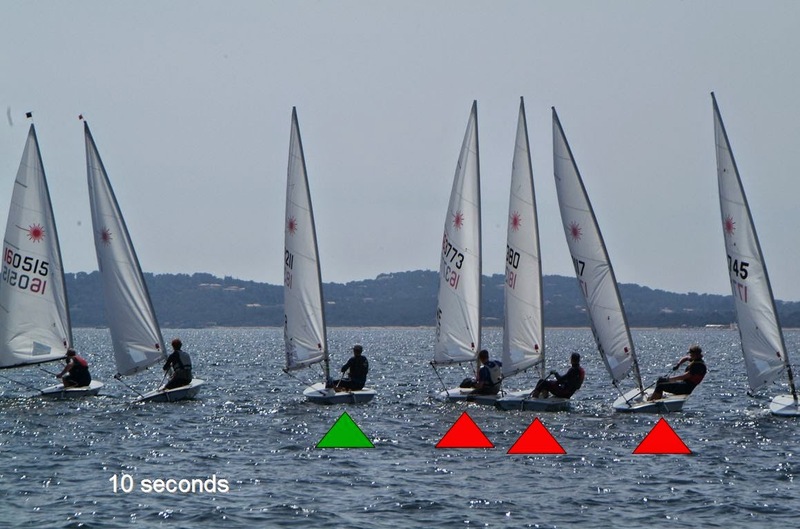 By reacting with 30 seconds to go, Paul effectively slowed those boats to weather of him. That also looks to have bought him some time, as he would have slowed his own boat. He then had the luxury of cracking off earlier and got the jump on them. Brilliant stuff!